Since 2013, Slots.lv has been giving players an opportunity to take their play with them on the go with a great mobile app, and this has put them in a position to get a significant portion of the market because of the solid experience they offer up. They have a license to operate from Kahnawake, which is a very respected jurisdiction to have a license from. They are particularly serious about fining or pulling the license of companies that do not adhere to their rules, so it’s clear that they’re serious about protecting the integrity of the games along with the personal information and financial details of the players that enjoy those games. If up to $5,000 in bonuses just for signing up sounds like a good deal to you, then you’ll like the promotions that this site has available. It starts with a 200 percent match worth a maximum of $1,000 with the HELLOSLOTS200 promo code. For the next eight deposits that you make after that, you’ll get additional 100 percent bonuses worth up to $500 apiece as well. This is a total of up to $5,000 in bonuses as a part of the welcome package available here, and it’s an incredible amount of value. What’s more is that it’s structured so that even small stakes players can get a good bit of value from these deals. All of these deals have 35x wagering requirements that can be completed with any games. There are other deals available after the welcome bonus as well. The MySlots Rewards program is a good example, and it gives you rewards points for every real money wager you make, even if it’s not on slots. 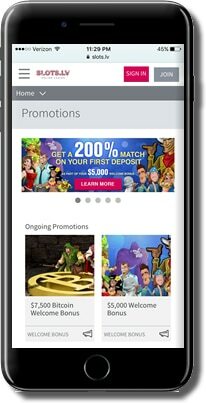 You can make it up through different levels of the rewards program with your mobile play, which will get you reload bonuses, promotional offers, the ability to cash in your points and other goodies. There is also a referral bonus of 100% up to $200 when your friends sign up for an account and make a deposit, a free $10 chip for joining the Slots.lv Facebook group, and a free $25 chip when you play games on both your desktop and mobile device. Finally, they have the weekly Double Up Promotion, which gives you a 100 percent match code every single week. You can use this offer up to seven times in each calendar week, and since each bonus is worth up to a maximum of $100, that’s $700 of weekly value added on top of everything else they give you. There’s a simple wagering requirement on this offer, and it can be completed with any of the games that they offer. The software used in this mobile app is a cohesive lobby area that combines titles from Realtime Gaming and Rival Gaming. The basic idea is that the games from both of these providers “play well together” in the sense that they are both based on the same software platform (Flash), so you can easily go between all of the different types of games that you want to look at and play without any issues. Inside of this software, the main playing lobby is obviously where you’ll be spending most of your time. However, you’ll also have access to sections that let you manage your account, and this includes everything from dealing with promotions to making deposits and withdrawals or contacting the support team. You can do anything with your account on the mobile platform that you can from a computer, and that’s the level of flexibility that players need when they’re out and about. The way the mobile interface works is that it’s primarily touchscreen driven. It’s also web-based, which means it will run in your web browser as a full screen application. 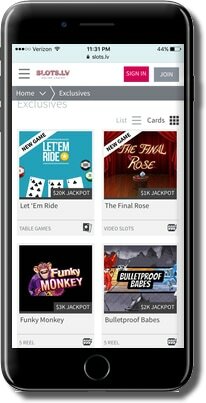 There are a few major advantages to the type of web platform that is used with the Slots.lv Mobile Casino app, and it starts with the simple fact that you can connect with virtually any type of phone that has a touchscreen interface. It doesn’t matter if your smartphone or tablet uses iOS, Android, Blackberry or any other operating system as long as it has an Internet browser and a connection. Another advantage to this type of interface is that it doesn’t take up any space on your phone. You don’t have to download any apps or worry about big data charges from constant updates for games that you might not even play as a part of the app itself. This is the smoothest and easiest approach for mobile casino games, and it helps to give players the best experience possible. As the name Slots.lv heavily implies, there are a ton of mobile slots available in this app. It all starts with the video slots, since those are the most popular games in the genre, and there are a couple of main lines of games that matter the most for most players in most situations. The Real Series of slots by Realtime Gaming is one of those, and its biggest feature is a set of extra progressive jackpots. Each individual game in this series has its own segregated jackpot (or sometimes as many as four segregated jackpots at different levels). They also cover a lot of exciting themes with different types of value-packed features. The other major series of games is the i-Slots selection by Rival Gaming. The idea here is that these games are based on stories that unfold as you play. Depending on what you do in the games, you can get different endings as you progress through various stages of play, which in turn give you the opportunity to win different prizes and enjoy various features. There are also other video slots that don’t fall into either of these series, and there are a number of classic slots as well. The variety of slots is pretty solid here, and you’ll have a hard time not finding something that appeals to you. Rounding out the game selection is the offering of table games. It’s not the most in-depth selection of table games, but they do have classic table games like roulette and casino poker available as well as a number of different types of blackjack and video poker. In addition to these games, players can get in on the action with scratch cards and keno too. The payment method selection consists of bitcoin, major credit cards like MasterCard and Visa along with direct cash transfers and bank wire transfers. They have a good reputation for paying out quickly and reliably, and they make it easy to do both deposits and withdrawals straight from your mobile device. They also have tutorials set up to make it easy to learn how to make transactions with bitcoin if you want to learn to take advantage of the anonymous nature of the cryptocurrency and all of the other benefits you’ll get like lower transaction fees. Support is provided through both telephone and email options. The telephone option is easy if you’re on mobile since you just have to press a single button on the interface to initiate the call, and email is made easy by them offering a form that you can fill out straight from the casino lobby. This keeps you from having to open up your email app and fumble around with figuring out the support team’s email address, etc. In summary, the Slots.lv Mobile Casino app is definitely all about some mobile slots, but they also have table games and a lot of promotions. This is a well rounded site that provides a wide range of players with significant value, no matter the stakes you play, how often you want to play or if you even care to ever log in using your computer. They have a lot going on that benefits their players in a major way, and it’s the kind of thing that we would like to see more of from their competitors.